The all-new Air Breeze. Quieter, more efficient, and precision engineered to deliver more energy at lower wind speeds than any other wind generator in its class. Air Breeze is the next generation of Air turbines. What's the difference between the Air X and the Air Breeze? We are asked that question a lot. Air series turbines are excellent choices for boaters and renewable energy hobbyists. In sustained winds above 10 mph, these turbines can produce enough electricity to run a few compact fluorescent light bulbs or small appliances for several hours. 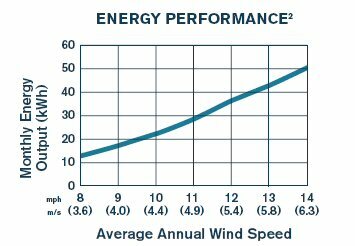 Typical production in 10-12 mph winds is about 20-30 kilowatt hours per month. They will not run your entire household energy load. The Air Breeze was introduced in 2007 as the next generation of the Air X turbine. Both the Air Breeze and the Air X come in 12 or 24 volts DC; are available in marine or land versions; and have a 3 year warranty. The Air X has a 48 VDC model as well. The Air Breeze does not currently have a 48 volt model. The quieter Air Breeze features newly designed blades and higher efficiencies at lower wind speeds. 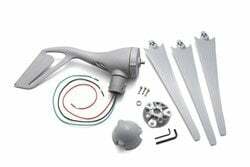 The manufacturer will continue to produce the Air X for the foreseeable future, however, because of the increased efficiency at lower wind speeds and better blade design, the Air Breeze should be a superior model for most small wind applications. We recommend proper overcurrent protection for your wind system. Something like the Baby Box from Midnite Solar and the appropriate sized din rail breaker serve to protect the conductors from the wind turbine to the battery bank as well as provide disconnecting means. Additionally, the 2-Position Stop Switch for Air Turbines allows you to stop the blades from spinning to take it down for servicing, or to protect it from particularly high winds. The most powerful wind generator in its class. The all-new Air Breeze. quieter, more efficient, and precision engineered to deliver more energy at lower wind speeds than any other wind generator in its class. Air Breeze is the next generation of Air wind turbines. 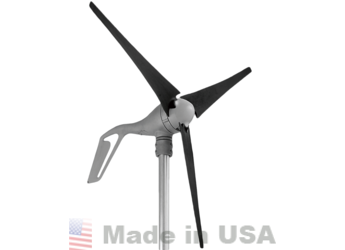 What is the minimum size battery bank I can install with this wind turbine? For all 12V units it's 400 amp hours. For all 24 and 48 volt units it's 200 amp hours. Why is this so? The reason is because the smaller the battery bank, the more time the turbine will spend in regulation mode. In other words, when the battery bank is full, the turbine will be regulating, and this puts more stress in the internal components of the turbine, which in turn shortens the life of the unit. According to the manufacturer, an inadequately sized battery bank will void the warranty for the turbine. Is there any way around the minimum sized battery bank? IF one uses a diversion load controller with a properly sized diversion load, one can get away with a smaller battery bank. My Air wind turbine seems to start spinning but then quickly slow down and not work. What's wrong? Because the AIR series have internal electronic charge controllers, they must be connected to a battery bank with a voltage of at least 10.5 volts DC in order to function. When customers observe that their AIR is spinning up then braking in a repeating cycle (spin up to speed, LED flashes for a second or two, then a sudden braking) this almost always indicates that the AIR is either not connected to the battery bank or the battery bank is bad. Common causes are a failed wire connection, a blown fuse, mis-wiring the stop switch, grossly undersized wiring, or severely discharged or damaged batteries. Can I connect my AIR directly to a pump or light? No. The turbine has an electronic controller and it must be connected to a battery bank to function properly. The turbine cannot be connected directly to a load such as a pump, fan or inverter. Why am I only measuring 5 or 6 volts from my AIR? The turbine controller circuitry must sense a battery bank voltage of 10.5 volts (for a 12V turbine) or 21 volts (for a 24V turbine) in order to operate properly. If you attempt the "drill spin" test, as outlined in the Bench Test section of the manual, please note that the turbine must be connected to a battery. If done without the battery connection, you will only measure a fraction of the rated voltage output. This is normal. How do I know the AIR is charging? For a precise indication of charge current you will need to install an amp meter (ammeter) in your system. The meter or meter shunt should be installed in-line on the positive wire. Almost any amp meter with a suitable current capacity and range will work. We offer a 30 Amp ammeter (in the search bar above on our site, just search for the phrase '30A ammeter'). Can I run my AIR through my solar panel controller? Because the turbine must be able to sense battery bank voltage, the AIR cannot be run through external controllers or devices that contain diodes. These are frequently found in solar panel controllers, to keep the panels from discharging at night - but, these diodes will put the turbine into "open circuit" mode and prevent energy production. How do I use the stop switch? When wired as shown in the manual diagram, RUN is up and BRAKE is down. Do not use the center switch position - this is "open circuit" and the turbine will not produce any charging energy for you. Worse yet, this position will cause the turbine to repeatedly cycle between spinning and braking, which can cause excessive wear and can void your warranty. The stop switch is included with the Marine version of our AIR products, so that sailors can turn off the turbine while in a slip or mooring. In other cases, the stop switch is not needed and the AIR will brake on its own when in regulation or during extremely high wind speeds. If your installation calls for a stop switch, you can purchase a 50A stop switch (in the search bar above on our website, just search for the phrase 'stop switch'). What does the red LED indicate? The red LED on your new turbine can provide important information. When steady, the AIR is charging. Slow blinking indicates regulation. If you don't see a charge indicator or regulation flashing, under normal operating conditions, then check your wiring for bad connections or breaks. Don't forget to check the fuse or circuit breaker.